The extreme properties of neutron stars provide unique opportunities to put constraints on new particles and interactions. In this paper, we point out a few interesting ideas that place constraints on light millicharged fermions, with masses below around an eV, from neutron star astrophysics. The model-independent bounds are obtained leveraging the fact that light millicharged fermions may be pair produced copiously via non-perturbative processes in the extreme electromagnetic environments of a neutron star, like a Magnetar. The limits are derived based on the requirement that conventional Magnetar physics not be catastrophically affected by this non-perturbative production. It will be seen that Magnetar energetics, magnetic field evolution and spin-down rates may all be influenced to various degrees by the presence of the millicharged particles. K. Cheung and T.-C. Yuan, Hidden fermion as milli-charged dark matter in Stueckelberg Z-prime model, JHEP 03 (2007) 120 [hep-ph/0701107] [INSPIRE]. D. Feldman, Z. Liu and P. Nath, The Stueckelberg Z-prime Extension with Kinetic Mixing and Milli-Charged Dark Matter From the Hidden Sector, Phys. Rev. D 75 (2007) 115001 [hep-ph/0702123] [INSPIRE]. K.R. Dienes, C.F. Kolda and J. March-Russell, Kinetic mixing and the supersymmetric gauge hierarchy, Nucl. Phys. B 492 (1997) 104 [hep-ph/9610479] [INSPIRE]. B. Batell and T. Gherghetta, Localized U(1) gauge fields, millicharged particles and holography, Phys. Rev. D 73 (2006) 045016 [hep-ph/0512356] [INSPIRE]. PVLAS collaboration, Experimental observation of optical rotation generated in vacuum by a magnetic field, Phys. Rev. Lett. 96 (2006) 110406 [Erratum ibid. 99 (2007) 129901] [hep-ex/0507107] [INSPIRE]. PAMELA collaboration, An anomalous positron abundance in cosmic rays with energies 1.5–100 GeV, Nature 458 (2009) 607 [arXiv:0810.4995] [INSPIRE]. J.I. 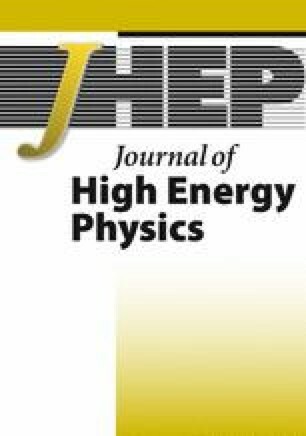 Collar et al., New light, weakly-coupled particles, in Fundamental Physics at the Intensity Frontier, Rockville, MD, U.S.A., November 30–December 2, 2011 [INSPIRE]. H. Gies, J. Jaeckel and A. Ringwald, Accelerator Cavities as a Probe of Millicharged Particles, Europhys. Lett. 76 (2006) 794 [hep-ph/0608238] [INSPIRE]. S. Davidson and M.E. Peskin, Astrophysical bounds on millicharged particles in models with a paraphoton, Phys. Rev. D 49 (1994) 2114 [hep-ph/9310288] [INSPIRE]. S. Davidson, S. Hannestad and G. Raffelt, Updated bounds on millicharged particles, JHEP 05 (2000) 003 [hep-ph/0001179] [INSPIRE]. E. Masso and J. Redondo, Compatibility of CAST search with axion-like interpretation of PVLAS results, Phys. Rev. Lett. 97 (2006) 151802 [hep-ph/0606163] [INSPIRE]. S.A. Abel, J. Jaeckel, V.V. Khoze and A. Ringwald, Illuminating the Hidden Sector of String Theory by Shining Light through a Magnetic Field, Phys. Lett. B 666 (2008) 66 [hep-ph/0608248] [INSPIRE]. R. Foot and A. Kobakhidze, A Simple explanation of the PVLAS anomaly in spontaneously broken mirror models, Phys. Lett. B 650 (2007) 46 [hep-ph/0702125] [INSPIRE]. A. Melchiorri, A. Polosa and A. Strumia, New bounds on millicharged particles from cosmology, Phys. Lett. B 650 (2007) 416 [hep-ph/0703144] [INSPIRE]. C. Thompson and R.C. Duncan, The Soft gamma repeaters as very strongly magnetized neutron stars — 1. Radiative mechanism for outbursts, Mon. Not. Roy. Astron. Soc. 275 (1995) 255 [INSPIRE]. A.K. Harding and A.G. Muslimov, Particle acceleration zones above pulsar polar caps: electron and positron pair formation fronts, Astrophys. J. 508 (1998) 328 [astro-ph/9805132] [INSPIRE]. J. Dyks and B. Rudak, Approximate expressions for polar gap electric field of pulsars, Astron. Astrophys. 362 (2000) 1004 [astro-ph/0006256] [INSPIRE]. J.A. Hibschman and J. Arons, Pair multiplicities and pulsar death, Astrophys. J. 554 (2001) 624 [astro-ph/0102175] [INSPIRE]. G.V. Dunne, Heisenberg-Euler effective Lagrangians: Basics and extensions, in From fields to strings: Circumnavigating theoretical physics. Ian Kogan memorial collection (3 volume set), M. Shifman, A. Vainshtein and J. Wheater eds., pp. 445–522 (2004) [ https://doi.org/10.1142/9789812775344_0014] [hep-th/0406216] [INSPIRE]. V.I. Ritus, Effective Lagrange function of intense electromagnetic field in QED, in Frontier tests of QED and physics of the vacuum. Proceedings, Workshop, Sandansky, Bulgaria, June 9–15, 1998, pp. 11–28 (1998) [hep-th/9812124] [INSPIRE]. S.L. Shapiro and S.A. Teukolsky, Black holes, white dwarfs, and neutron stars: The physics of compact objects, Wiley (1983) [INSPIRE]. R. Turolla, S. Zane and A. Watts, Magnetars: the physics behind observations. A review, Rept. Prog. Phys. 78 (2015) 116901 [arXiv:1507.02924] [INSPIRE]. J.A. Pons and U. Geppert, Magnetic field dissipation in neutron star crusts: From magnetars to isolated neutron stars, Astron. Astrophys. 470 (2007) 303 [astro-ph/0703267] [INSPIRE]. J.P. Ostriker and J.E. Gunn, On the nature of pulsars. 1. Theory, Astrophys. J. 157 (1969) 1395 [INSPIRE]. 2.Department of PhysicsUniversity of Wisconsin-MadisonMadisonU.S.A.